"Science is what we do to keep from lying to ourselves." "Whoever would overthrow the liberty of a nation must begin by subduing the freedom of speech." "First man take drink, then drink take drink, then drink take man." "Arriving at one goal is the starting point to another." [re: parenthood] "You get a lot of tension, you get a lot of headaches. I do what it says on the aspirin bottle: Take two and keep away from children." "The truth is so top secret / It only stands to reason / That anyone exposing it / Is culpable of treason." "Where we love is home - home that our feet may leave but not our hearts." "The general root of superstition is that men observe when things hit, and not when they miss, and commit to memory the one, and pass over the other." "When a whole nation is roaring Patriotism at the top of its voice, I am fain to explore the cleanness of its hands and purity of its heart." "A casual stroll through the lunatic asylum shows that faith does not prove anything." "We give our highest rewards to those who convincingly disprove established beliefs." "To kill a man is not to defend a doctrine, but to kill a man." "Democracy is not about majority rule; it is about minority rights. If there is no culture of not simply tolerating minorities, but actually treating them with equal rights, real democracy cannot take root." "The deepest sin against the human mind is to believe things without evidence. Science is simply common sense at its best - that is, rigidly accurate in observation, and merciless to fallacy in logic." "There is no absurdity so obvious that it cannot be firmly planted in the human head if you only begin to impose it before the age of five, by constantly repeating it with an air of great solemnity." "We have always known that heedless self-interest was bad morals; we know now that it is bad economics." "In this world of sin and sorrow there is always something to be thankful for; as for me, I rejoice that I am not a Republican." "Life is trouble. Only death is not. To be alive is to undo your belt and look for trouble." "A film is never really good unless the camera is an eye in the head of a poet." "The average Hollywood film star's ambition is to be admired by an American, courted by an Italian, married to an Englishman, and have a French boyfriend." "In any war there are heroes on both sides . . ."
"Imagination is but another name for super intelligence." "Life is hard; it's harder if you're stupid." "You're braver than you believe, and stronger than you seem, and smarter than you think." "Notoriety is often mistaken for fame." "But all the magic I have known, I've had to make myself." "After all, what's life, anyway? We're born, we live a little while, we die." "Today is your day! Your mountain is waiting. So . . . Get on your way!" "Anyone who participates in the Trans-Pacific Partnership is an enemy of the United States of America. Any American who participates in the Trans-Pacific Partnership is a traitor." "Like a boil that must be opened with all its ugliness to the natural medicines of air and light, injustice must be exposed to the light of human conscience before it can be cured." "Flattery is like chewing gum. Enjoy it but don't swallow it." "People striving for approval from others become phony." "Money is a protection, a cloak; it can buy one quiet and some sort of dignity." "There is one other reason for dressing well, namely that dogs respect it, and will not attack you in good clothes." "A right is a responsibility in reverse." "An empty man is full of himself." "Stupidity is the same as evil, if you judge by the results." "It takes twenty years to build a reputation, and five minutes to ruin it." "The most futile thing in this world is any attempt at exact definition of character. All individuals are a bundle of contradictions." "The essence of immorality is the tendency to make an exception of one's self." "I am a sort of preacher. I like to talk to people and get them to change their views when I think their views are wrong. Why else would anyone write a book?" "The inhabitants of the earth are of two sorts: those with brains, but no religion, and those with religion, but no brains." "Whenever you write, whatever you write, never make the mistake of assuming [that] the audience is any less intelligent than you are." "Imagination is the highest kite [that] one can fly." "It's not your abilities that show who you are, it's your choices." 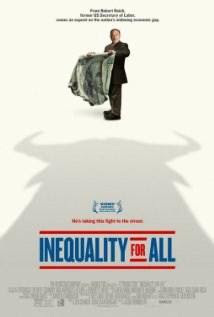 Movie Review: "Inequality For All"
Economist Robert Reich's documentary film "Inequality For All" is opening in the U.S.A. on September 27th. MY REVIEW: "A 'must see' film. Go see it because I said so." As-of mid 2013, Netflix became the dominant streaming platform, accounting for one-third of all U.S. video streaming - double the activity on YouTube. Iodized salt was introduced in the U.S. in 1924. A study in 2013 found that this one change in diet raised the country's collective I.Q. An international team published a three-year study in the journal "Nature Climate Change" that shows marine species moving away from the tropics and toward the poles at an average of 45 miles per decade, compared to only 4 miles per decade for species on land. In a study of the effects of pesticides used in the U.S., the F.D.A says that arsenic levels in brown rice are higher than in other forms, with lowest levels in instant rice, The F.D.A. study report also says that levels of arsenic found in rice are probably not a health problem, but that consumers should 'vary their diet' just in case. This got cleared up for me today on the Randi Rhodes Radio Show. Syria and other parts of the Middle East have experienced a severe drought for the last five years. In Syria, 85 percent of the livestock died, and 75 percent of the crops failed. So the hungry citizens migrated to the cities, hoping for work or food or some way to survive, which they did not find. Despotic President Bashar al-Assad noticed that the shortage in wheat had raised the price sky-high, so he appropriated the harvest and sold 1.5 million metric tons to other countries and then pocketed the money (most likely to secret off-shore accounts). The people are starving, there is no bread and little water, so the masses have been ripe for revolutionary propaganda from Muslim fanatical groups such as al-Qaeda and the taliban. The Syrian Civil War has killed hundreds of thousands of civilians since the official beginning in the Spring of 2011. There is no 'good' side here. The rebels are anti-democratic, Assad is anti-democratic. Russia is siding with Assad's government (for access to the oil fields), and the United Nations and the U.S.A have sided with the rebels, hoping that their eventual win will provide access to the oil fields. One of the serious solutions which has been kept from discussion is food-drops to the people of Syria. Problematic from the get-go since the rebels could hoard it for themselves, but air-dropping pallets of rice or wheat away from rebel strongholds and away from government strongholds could take the pressure off. Meanwhile, President Obama is carefully planning air strikes against a foreign country and hoping that the war-mongers and the Xian promoters of Armageddon do not get their wish for World War III.